“Hey, land this thing right now,” I told the veteran Alaska bush pilot at the controls of a Cessna Skywagon that was boring into a headwind 300 feet above the frozen Yukon River. I didn’t know from chunky. 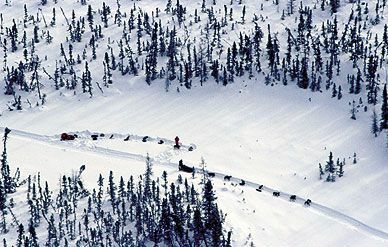 My real frustration was that I’d been assigned to cover the 1999 Iditarod sled-dog race—1,131 miles, 26 checkpoints, 60 entrants, each towed by up to 16 Alaskan huskies—and I hadn’t talked to a musher in three days. And now, directly beneath us, was the race leader. What happened next—or so the pilot later explained—was that, upon landing, the skis burst through a foot of “sugar snow,” then encountered a chunk of ice canted at a ramp-like angle that would have delighted Evel Knievel, given the distance it catapulted the Cessna. During that brief thrill ride, sunglasses, three-ring notebook, and roast beef sandwich broke free of gravity, climbing from the bottom of the windshield to the top. When the musher caught up to us, he said only “Wow.” Meanwhile, I’d forgotten all the questions I’d intended to ask. “Well, take care,” I offered. “Me take care?” he replied. The pilot’s name was—well, let’s call him Mark. A member of the 30-aircraft Iditarod Air Force, he knew a lot of things. For instance: A musher’s ash sled costs $1,500, and his 16 dogs can be worth several thousand apiece. “Meaning what?” I asked. On that 11-day March odyssey, I recall other highlights.